How would you rate your experience with Donald Daters ? 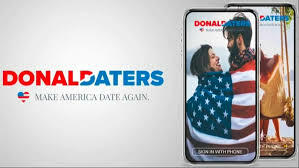 Seeking to “Make America Date Again”, Emily Moreno, a former aide to Senator Marco Rubio, created a website and, later mobile phone apps, that allow fans of Donald Trump to connect to one another. Moreno says that it’s difficult for many conservatives to find dates, especially those in larger, more liberal cities. On the day the app was launched, more than 1600 people signed up. The app allows for 25 free connections. Users can also see what other’s in their area are doing with the local activity feed. Unlike other apps, such as Righters, Moreno doesn’t declare war on liberals or non-fans of Trump who might use the app, as long as no hate speech is used. Users can block anyone they find offensive or undesirable. On the first day the app was available, a glitch allowed the app to leak all of the user’s real names, personal messages, and photo’s. The site was immediately closed and Moreno made a public statement saying that the technical problem would soon be corrected and the app restored. The site was also criticized for its original welcome photo showing a Trump rally that featured North Carolina conservative activist William Barrett Riddleberger, who had been convicted in 1995 of felony indecent liberties with a child. The photo of Barrett Riddleberger and his wife was later removed. Headquarters for Donald Daters is located in North Olmstead, Ohio. Question 1: What is the phone number for Donald Daters? Answer 1: The phone number for Donald Daters is (440) 673-3969. Question 2: Who is the CEO of Donald Daters? Answer 2: The CEO of Donald Daters is Emily Moreno. Question 3: Who founded Donald Daters? Answer 3: Donald Daters was founded by Emily Moreno in 2018. 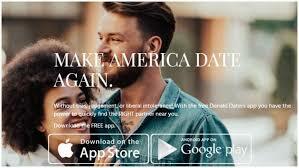 Want to make sure Donald Daters sees your comment or complaint?